If you would like to know more about how this got started you can read the original Lent post here. 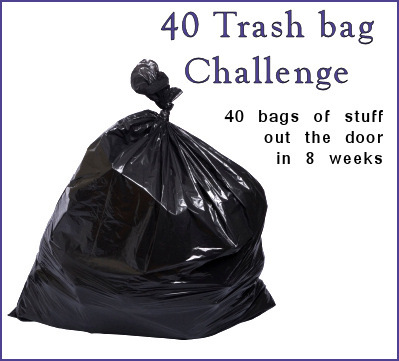 I started the 40 trashbag challenge in order to declutter my house. 1. Pick what size of trash bag you want to use. I used tall kitchen bags. 2. Each week day for eight weeks fill one bag (or equivalent). It can be a bag of stuff, toys, clothes, papers — anything, a box of books, an old TV. Anything that you can count as clutter is fair game. 3. Update on your blog how it goes. I like this little bag icon. Feel free to use it. If you want to be linked in here leave a comment and I will add you. From Across the Net has picked up the challenge and is doing really well. My 40 bags of stuff. Boy, do I ever need to do this! Are you using the 13-gallon bags? I used the 13 gallon bags. Also, I counted 1 book box as a “bag”, big stuff that would fill a bag I counted as one. Have fun! I love your idea. So much so that I posted it on my blog. Today we got rid of quit a few things and straightened up the area of the basement where we store Christmas. It’s a start. I really like this idea but I’m not sure I can manage it in 8 weeks. I’d have to modify it slightly to one bag a week for 40 weeks – that would take me to mid-November and that’s more manageable. Would that be ok? May I use the 40 Trash Bags picture but without the words “40 Bags of Stuff out the door in 8 weeks”? Hello, I just left a comment that is going to show up under “efcjmt”. Sorry about that, I was on the mission team blog for our church. My blog is under this address, http://www.whengoodpeoplegettogether.blogspot.com. Sure – what ever works for an individual is fine you are more than welcome to use the image if you like. What a great idea!! I have been struggling with having too much stuff. My stuff, my kids stuff, and since my parents have both past away now, their stuff too. This would make my husband sooo happy because, he really has no stuff! In the past I given up pop for Lent, but this year it was my New Years Resolution. Especially after seeing the the Sisters on Oprah and how free they were from “stuff”, I am up going to do this! I’m in. Also linking w/ Faith & Family’s effort….. I will strat this with my kids. Thank you for sharing. God bless. In doing some research for my blog post today on spring cleaning, decluttering and decorating, I came across your blog. I linked this post in my article, as I think my readers will appreciate the instructions of how to do the 40 day challenge – and I thought you might want to know!